These original vintage industrial Cox stacking chairs are one of our large range of metal stacking chairs that we currently have for sale; ideal for any retro interior, restaurant, cafe etc. These vintage industrial Cox stacking chairs are extremely sturdy, and have a red metal steel frame with a strong and sturdy seat and back rest. A classic design from 1962, this chair is being sold individually, but we do have more available. These retro tubular metal Cox stacking chairs are in good condition for their age, however, there are signs of general wear and tear due to them being used on a daily basis. Please note: this price is for one chair. Please contact us – we have quantity of these chairs. We also offer the service of having our stacking chairs professionally altered by our in-house welder. 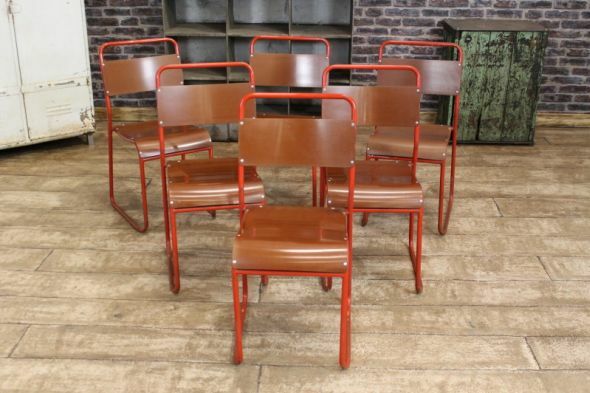 These vintage stacking chairs can have extra height added, making them ideal for bars and pubs. Where available, the paint colour will be matched as closely as possible. Please be aware that there is an additional charge of £45.00 per chair to have them altered. Please see the photos below, and don’t hesitate to contact us for more information.